Abstract: We aimed to assess patient acceptance and effectiveness of a 12-month structured management program in patients after an acute coronary syndrome (ACS) event who were treated in a special setting of office-based cardiologists. The program comprised patient documentation with a specific tool (Bundesverband Niedergelassener Kardiologen [German Federation of Office-Based Cardiologists] cardiac pass with visit scheduling) shared by the hospital physician and the office-based cardiologist, the definition of individual treatment targets, and the systematic information of patients in order to optimize adherence to therapy. Participating centers (36 hospitals, 60 office-based cardiologists) included a total of 1,003 patients with ACS (ST-segment elevation myocardial infarction [STEMI] 44.3%, non-ST-segment elevation myocardial infarction [NSTEMI] 39.5%, unstable angina pectoris [UA] 15.2%, and unspecified 1.0%). During follow-up, treatment rates with cardiac medication remained high in all groups, with dual antiplatelet therapy in 91.0% at 3 months, 90.0% at 6 months, and 82.8% at 12 months, respectively. Twelve months after the inclusion, a total of 798 patients (79.6%) still participated in the program. Eighteen patients (1.8%) had died after discharge from hospital (6 in the STEMI, 12 in the NSTEMI group), while for 58 the status was unknown (5.8%). Based on a conservative approach that considered patients with unknown status as dead, 1-year mortality was 7.6%. Recurrent cardiac events were noted in14.9% at 1 year, with an about equal distribution across STEMI and NSTEMI patients. In conclusion, patients’ acceptance of the ProAcor program as determined by adherence rates over time was high. Treatment rates of recommended medications used for patients with coronary heart disease were excellent. The 1-year mortality rate was comparatively low. These epidemiological data show that it is crucial for patients after an ACS event to follow a stringent risk management regimen for prevention of secondary coronary events. To achieve this, the respective guidelines recommend life-long treatment with drugs that repress thrombocyte function (aspirin and/or P2Y12 antagonists), decrease elevated low-density lipoprotein (LDL) cholesterol levels (statins), and lower elevated blood pressure (beta blockers and inhibitors of the renin–angiotensin–aldosterone [RAS] system).6,7 More than a decade ago, data from two registries (GRACE and CRUSADE)8,9 showed a clear association between adherence to treatments and survival. In Germany, an existing program offered by the Bundesverband Niedergelassener Kardiologen [German Federation of Office-Based Cardiologists] (BNK) comprises patient documentation with a specific instrument (BNK cardiac pass with visit scheduling) done jointly by the hospital physician and the office-based cardiologists, the definition of treatment targets and the structured information of patients in order to optimize adherence to therapy. To gain additional evidence on this long-term ACS care program that engages patients, the ProAcor study was implemented. It observes patients’ adherence to and the effectiveness associated with this program. The outcomes of this program are here reported as with focus about patients’ adherence to medication, treatment patterns, and outcomes under real-life conditions. The primary goal of the ProAcor study was the assessment of patients’ willingness to be guided through the structured outpatient care program. Further, it documented drug utilization patterns, patient satisfaction, and effectiveness measured by mortality and cardiac morbidity. ProAcor is an open, nonrandomized, and observational prospective study that was set up to investigate patients with ACS treated under real-life conditions (outside clinical studies). A total of 36 clinics and hospitals and 60 resident cardiologists from all German federal states participated in the ProAcor study. This study was approved by the Ethics Commission of the Bavarian Medical Chamber on November 8, 2011 (project number 11110); pertinent guidelines for data protection were respected. The study identifier in ClinTrials.gov is NCT01490645. Hospital and office-based cardiologists were entitled to participate if they treated a significant number of ACS patients and had sufficient personnel and trial experience for participation in the study. They also needed to have access to the web-based “Electronic Quality Management System (eQM)” of BNK Service GmbH. Patients were eligible for documentation (inclusion criteria) if they were at least 18 years old; had been hospitalized owing to a STEMI, NSTEMI, or UA event; and had provided written informed consent for study participation within 7 days of the ACS index event. Patients could not be documented if one or more of the following criteria were met (exclusion criteria): 1) UA, STEMI, and NSTEMI precipitated by or as a complication of surgery, trauma, or gastrointestinal bleeding or post percutaneous coronary intervention (PCI). 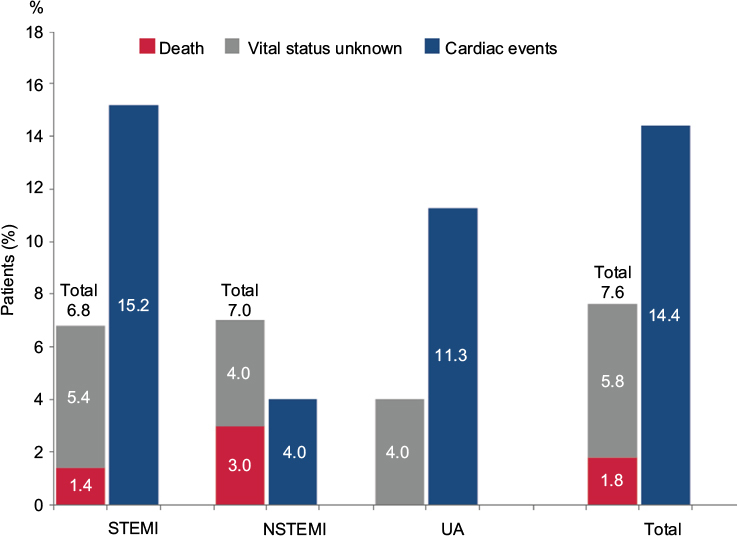 2) UA, STEMI, and NSTEMI occurring in patients already hospitalized for other reasons. 3) Presence of any condition/circumstance that in the opinion of the investigator could significantly limit the complete follow-up of the patient (eg, tourist, nonnative speaker or one who does not understand the local language, known diagnosed psychiatric illness, active cancer disease). 4) Patient not intended to be treated according to current guidelines, including patients participating in a clinical trial. The study flow including the study components is shown in Figure 1. In participating hospitals, the treating physician approached consecutive suitable patients, informed them about the goals and requirement of the study, and obtained written consent. The participation in the study did not change the way the patient was treated. Abbreviations: BNK, Bundesverband Niedergelassener Kardiologen (German Federation of Office-Based Cardiologists); QoL, quality of life. During the hospital phase of the study, patients obtained the Cardio Pass (BNK Herzpass®, Munich, Germany) of the German Federation of Office-based Cardiologists. This booklet is used for the shared documentation of the patient’s clinical history by the hospital physician and the office-based cardiologist with the aim of facilitating transfer of relevant information and agreement on common goals of secondary prevention. The Cardio Pass also includes a visit planner. Further, the patients receive information brochures and cards about their disease and recommended lifestyle changes to prevent further cardiac events after hospital stay. After discharge from hospital, patients visited their office-based cardiologists for examinations and feedback about their state of health at intervals of 3, 6, and 12 months. At each of these three visits, the patient’s individual treatment goals (in terms of antiplatelet and other cardiac drug use, blood pressure, lipid and blood glucose values) and recommended lifestyle changes were assessed and discussed between the patient and the treating (office-based) cardiologist. At these visits, the Cardio Pass was updated with therapy goals (which could be modified during follow-up, if needed) and medication changes. To remind the patient about the lifestyle and treatment goals, information cards were handed out (after 9 months sent via mail) every 3 months during the program duration. To evaluate patient satisfaction with the ProAcor patient management program, a proprietary questionnaire was developed that stated the questions displayed in Table 1. Notes: Values are n (%), if not specified otherwise; 800 of the 1103 patients filled in the questionnaire on patient satisfaction. Abbreviations: STEMI, ST-segment elevation myocardial infarction; NSTEMI, non-ST-segment elevation myocardial infarction; UA, unstable angina. Physicians rated the adherence to drug therapy on the basis of their own subjective assessment (without specifically asking the patients) after 12 months. They had the options “always (7 days per week)”, “mostly (4–6 days per week)”, “rarely (1–3 days per week)”, and “never (0 days per week)”. At all visits, data were collected from the patient charts into the Electronic Quality Management System (eQM), a central database. Collected parameters are summarized in Table 2. Notes: aProcedures performed at the hospital. bSource data for this information was hospital discharge letter (index event). cAny new episode of the ACS, stroke, CV procedure, hospitalization or death. dPatient information cards were handed out intuitively according to patients’ situation (eg, only current smoker should receive information on smoking cessation). ePatient information cards were sent out by the investigator, or BNK Service GmbH if desired by the investigator. Abbreviations: BNK, Bundesverband Niedergelassener Kardiologen; HDL, High-density lipoprotein; LDL, Low-density lipoprotein; CV, Cardiovascular; CHD, coronary heart disease; ACS, acute coronary syndrome. Data were documented in a pseudonymized way (i.e., only the treating physicians knew their patients’ identity). Measures for quality assurance comprised plausibility checks during data entry, statistical validation, and queries to centers if information was missing or ambiguous. A sample size of 1,000 patients was originally planned to estimate the patient acceptance rates of the program (primary end point) with a precision of 5%. An exploratory–descriptive statistical analysis covering parameters (qualitative, quantitative, and text fields including derived and coded variables) from the electronic case report forms (CRFs) was performed. Binary, categorical, and ordinal parameters were summarized by means of absolute and percentage numbers within the various categories, including “missing data” as a valid category at the baseline visit. Numerical data were summarized by means of standard statistics (ie, number of available data, number of missing data, mean, standard deviation, minimum, median, maximum, and lower and upper quartile). Where useful, the summary statistics were presented by visit. Calculations were performed with nQuery Advisor 7.0. A total of 1,003 patients were included and at least one visit documented (full analysis set). In 11 patients, the type of ACS was not specified. Eight hundred eighty-seven patients had information about the ACS type and had at least one follow-up visit (evaluable patients set). One year after the inclusion, a total of 798 patients (90.0%) still participated in the program, while 89 patients (10.0%) did not. Dropout rates were somewhat higher in the STEMI group (11.1%) and the UA group (12.0%), respectively, compared to the NSTEMI group (8.1%). Mean participation time in the program was 11.4±2.0 months overall. Reasons for premature withdrawal from the program in the 89 patients were change of their medical doctor in 10 cases, withdrawal of informed consent in 14 cases, patient lost to follow-up in 57 cases, death of the patient in 3 cases, and patient relocation in 5 cases. Of the evaluable patients, male patients prevailed (73.6%; Table 3 top). The rate of males was higher in the STEMI and UA groups compared to the NSTEMI group. Mean age of patients was 61.7±11.6 years overall; in the STEMI group it was somewhat lower (58.9±11.2 years) than in the NSTEMI group (64.0±11.6 years) and in the UA group (64.3±10.9 years). Mean body mass index was 28.4±4.7 kg/m2, with no relevant differences between groups. Notes: Values are n (%), if not specified otherwise. Abbreviations: STEMI, ST-segment elevation myocardial infarction; NSTEMI, non-ST-segment elevation myocardial infarction; UA, unstable angina; CHD, coronary heart disease; PTCA, percutaneous transluminal coronary angioplasty; SD, standard deviation; TIA, transient ischemic attack; PRIND, prolonged ischemic neurological deficit. The most frequently noted concomitant diseases were arterial hypertension (72.6%), hyperlipoproteinemia (59.2%), diabetes mellitus (22.2%), and renal insufficiency (7.2%) (Table 3 center). Current smoking was noted in 29.1% of patients, previous smoking in 27.6%. Valve disorders were reported in 6.8% and heart rhythm disorders (most frequently atrial fibrillation) in 7.4%. Patients in the NSTEMI group tended to have a higher prevalence of concomitant diseases and cardiovascular risk factors compared to patients in the STEMI and UA groups, respectively. A prior cardiac event was noted in 15.3% overall, with higher frequency in the NSTEMI and UA groups compared to the STEMI group. Such events had led to earlier percutaneous transluminal coronary angioplasty (PTCA) in 12.1%, stent implantation in 11.1%, and cardiac bypass surgery in 1.9%, respectively (Table 3 bottom). The index cardiac event was STEMI in 407 evaluable patients (of 444 total), NSTEMI in 347 patients (of 396 total), and UA in 133 patients (of 152 total). Overall, for 750 patients (84.6%) the index event was their first manifestation of CHD. 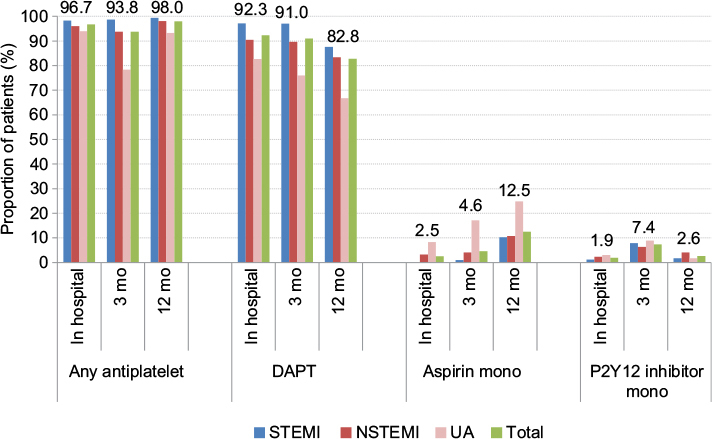 By subgroup, this was the case for 370 patients in the STEMI group (90.9%), 289 patients in the NSTEMI group (83.3%), and 91 patients in the UA group (68.4%), respectively. In the context of the ACS index event, 828 patients (93.3%) received a PTCA, and 801 patients received a stent. The rates of PTCA and stents, respectively, were higher in the STEMI group compared to the NSTEMI and UA groups, respectively. After the index event, patients were discharged from the acute hospital after 6.8±8.4 days (median 6.0). Patients in the STEMI group stayed longer in the hospital (8.2±11.0, median 6.0) compared to patients in the NSTEMI group (6.1±5.2, median 5.0) and the UA group (4.0±3.5, median 3.0), respectively. For the treatment of the acute ACS index event, almost all patients (n=858, 96.7%) received at least one P2Y12 inhibitor or acetylsalicylic acid (ASA), (Figure 2). The great majority (819 patients, 92.3%) received dual antiplatelet therapy (DAPT). DAPT treatment rates were higher in STEMI patients (395 patients, 96.1%) compared to NSTEMI patients (314 patients, 90.5%) and UA patients (110 patients, 82.7%). At the initiation of P2Y12 inhibitor therapy, the respective drug was provided as a loading dose in 406 patients (45.8%). Notes: Values show the prescription rates (%) of the named drug classses or drugs in the total cohort, and in the STEMI, NSTEMI and UA subgroups. Abbreviations: DAPT, dual antiplatelet therapy; STEMI, ST-segment elevation myocardial infarction; NSTEMI, non-ST-segment elevation myocardial infarction; UA, unstable angina. Treatment rates with antiplatelet drugs remained high during the study follow-up. Of the evaluable patients at each visit, 812 patients (93.8%) after 3 months, 772 patients (92.7%) after 6 months, and 682 patients after 12 months (85.5%) received ASA/any of the P2Y12 inhibitors as monotherapy. DAPT was reported in 788 patients (91.0%) at 3 months, 750 patients (90.0%) at 6 months, and 661 patients (82.8%) at 12 months, respectively. For all time points, rates of antiplatelet drugs (any or DAPT) were higher in the STEMI group compared to the NSTEMI and UA groups. Almost all patients received some cardiac medication after the index event. Drug classes most frequently prescribed – besides platelet inhibitors in 858 patients (96.7%) – were beta blockers in 809 patients (91.2%), CSE inhibitors (statins) in 774 patients (87.3%), and ACE inhibitors in 611 patients (68.9%). Prescription rates of these drug classes are presented by ACS type in Figure 3. Figure 3 Cardiac medication other than antiplatelets during the course of the observation. Abbreviations: STEMI, ST-segment elevation myocardial infarction; NSTEMI, non-ST-segment elevation myocardial infarction; UA, unstable angina; RAAS, renin angiotensin aldosterone system; ACE-I, angiotensin converting enzyme inhibitor; ARB, angiotensin receptor blocker. 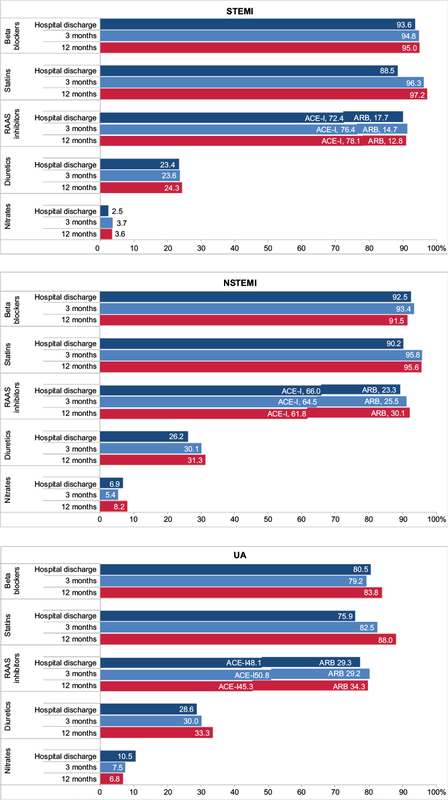 During follow-up, treatment rates with cardiac medication remained high in all groups (at least one drug in 857 patients [99.0%] at 3 months, in 829 patients [99.5%] at 6 months, and in 795 patients [99.6%] at 12 months). At all three time points, patients in the STEMI group received cardiac drugs more often than did patients in the NSTEMI and UA groups, respectively. Physicians rated the adherence of their patients after 12 months in 793 patients (100%). According to their (subjective) assessment, 698 patients (88.0%) were always adherent, 90 patients (11.3%) mostly adherent, 4 patients (0.5%) rarely adherent, and 1 patient (0.1%) never adherent. There were no relevant differences in therapy adherence among patients from the STEMI, NSTEMI, or UA groups, respectively. 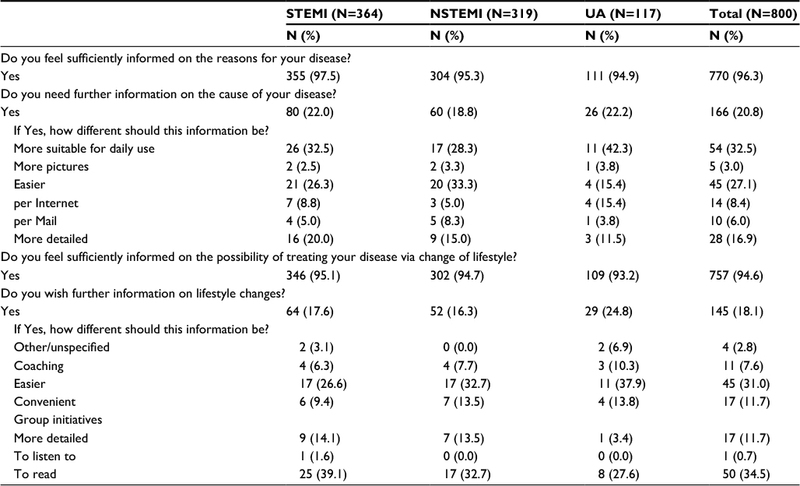 Patients were highly satisfied with the information about the risk factors for their disease and about the way to treat it by a change of lifestyle (Table 1). Of the patients, 96.3% felt sufficiently informed on the reasons for their disease, and 94.6% felt sufficiently informed on the possibility of treating theirr disease via change of lifestyle. Including all cases for which a definite survival status was not reported, mortality during the 12-month observation period was 7.6% at most (18 confirmed deaths, in addition to 58 patients lost to follow-up and thus of unclear vital status). After the index ACS event, new cardiac events occurred in 128 patients (14.4%, Figure 4) during the full observational period. Seventy-eight patients (9.0%) had the new event within the first 3 months, 30 patients (3.6%) between 3 and 6 months, and 35 patients (4.4%) between 6 and 12 months. The rate of new cardiac events was higher in the STEMI group (62 patients, 15.2%) than in the NSTEMI group (51 patients, 14.7%) and the UA group (15 patients, 11.3%), respectively. Figure 4 Death, unknown vital status, and cardiac events. Furthermore, the majority of reported events were angina pectoris (86 patients, 67.2%), STEMI (20 patients, 15.6%), NSTEMI (17 patients, 13.3%), or a combination of these events (5 patients, 3.9%). Eighteen of the 20 STEMI events occurred in patients in the STEMI group. The ProAcor study, reporting on almost 1,000 patients, with ACS treated first in 36 hospitals and later by 60 office-based cardiologists, assessed patients’ acceptance of a structured monitored program along with outcomes over 1 year. The adherence to the program was high. In order to increase therapy adherence and effectiveness in everyday clinical practice, essential features of the ProAcor study were the use of the Cardio Pass (Herzpass) containing information about patient history, medication and planning of visits, and patient education with cards and brochures about significance and measures for prevention of secondary cardiac events. On the basis of the high satisfaction patients expressed with regard to the information on the disease and the optional measures to treat it through lifestyle changes and medications, the program can be called successful. Treatment rates of recommended medications used for patients with CHD were excellent. Lack of compliance with treatment, eg, with antiplatelet agents, has been shown to be predictive of secondary events –such as stent thrombosis29 – in the follow-up of ACS patients. In fact, the observed mortality of 1.8% (confirmed) or 7.6% (most conservative approach), respectively, is lower than in several current ACS registries. In the German MONICA/KORA acute myocardial infarction registry, mortality was 3.2% in the first year after hospital discharge.30 For the Spanish DIOCLES study, in-hospital mortality was 4.1%, and in patients alive at discharge (follow-up available for 97.1%), 6-month mortality was 3.8%.31 This was already an improvement compared to the previous MASCARA32 registry study, which registered 10.5% deaths among patients after the same time period. Similarly, in the four French FAST-MI registry studies, mortality fell from 20% (1995) to 9.8% (2010) 1 year after hospital discharge.33 The CZECH-2 registry reported a 1-year mortality of 7.9%, the European MULTIPRAC registry of 2.4%, the Swiss SPUM-ACS of 4.6%, and the Swedish SCAAR registry of 6.9% (all data based on personal communication). ProAcor differs from the other mentioned studies in that it observed a special management program that schedules several follow-up examinations of ACS patients after hospital discharge and focuses on measures for patient information and education. A recent systematic review by the Cochrane Collaboration of the effects of educational components of cardiac rehabilitation, apart from improvement of QoL ratings, did not find statistically significant reductions of hospitalizations or mortality.34 In an earlier analysis by the US Agency for Healthcare Research and Quality, a branch of the Food and Drug Administration (FDA), of randomized trials of secondary prevention programs in CHD, measures for patients after hospital discharge diminished the frequency of recurring hospitalization by 15% and the risk of myocardial infarctions within 12 months by 17%.35 Reduced mortality rates became statistically significant only in a more long-term perspective of 24 or 60 months (47% and 24%, respectively). Probably, patient education works synergistically with newer antiplatelet medication regimens and rigorous adherence to them; nonpharmacological and pharmacological treatments together may lead to a measurable diminishment of mortality within 12 months, as found in the ProAcor study. Overall, the varying proportions of patients with STEMI/NSTEMI/UA and the completeness of follow-up make comparisons between studies difficult, but the low rate gives confidence that the patients in Germany in ProAcor do no worse than in comparable countries. ProAcor, like all registry-type observational studies, has limitations, among them different types of bias.36 Managing physicians are a positive selection of motivated and well-trained cardiologists; thus, outcomes of the structured program may not mirror the “average” clinical practice. Only 50%–60% of patients were followed up by a cardiologist. Moreover, participating patients themselves were likely more motivated than the average patient population to know more about their disease, to change their lifestyle, and read the offered materials in tight time frames. Less interested patients with a lower training and adherence level may have led to less favorable outcomes. Thus, as in other ACS registries, allocation or channeling bias may confound the relation between treatment and outcomes.37 The patient satisfaction questionnaire was developed by study group members and has not yet been formally validated.38 Social and cultural levels of the participants were not documented. Assessment of compliance with or adherence to drug therapy relied on the subjective assessment of physicians, not on other pill count, check of filled prescriptions at the pharmacy, or patient interviews. Also, owing to its limited size and relatively short duration, the ProAcor study does not allow statements on the adherence of patients and effectiveness beyond one year. In conclusion, patients’ acceptance of the ProAcor program, as determined by adherence rates over time, was high. Treatment rates of recommended medications used for patients with CHD were excellent. The 1-year mortality rate was low compared to that in other contemporary registries. We thank the participating investigators and their staff (listed in the supplementary materials). Further, we acknowledge the statistical work by Dipl.-Math. Peter Klein, d.s.h. statistical services GmbH, Rohrbach, Germany. Project management for the study was supervised by Susanne Oldenburg and Simon Glück, BNK Service GmbH (Dienstleistungsunternehmen des Bundesverbandes Niedergelassener Kardiologen e.V. ), Munich, Germany. Editorial support in generating this manuscript was provided by 3P Consulting, Seefeld, Germany. Results have been presented at the Scientific Sessions of the American Heart Association, November 10, 2015, Orlando, FL, USA. This study was sponsored by AstraZeneca GmbH, Wedel, Germany. The authors report no other conflicts of interest in this work. Nichols M, Townsend N, Scarborough P, Rayner M. Cardiovascular disease in Europe 2014: epidemiological update. Eur Heart J. 2014;35(42):2950–2959. Freisinger E, Fuerstenberg T, Malyar NM, et al. German nationwide data on current trends and management of acute myocardial infarction: discrepancies between trials and real-life. Eur Heart J. 2014;35(15):979–988. Roffi M, Patrono C, Collet JP, et al. 2015 ESC Guidelines for the management of acute coronary syndromes in patients presenting without persistent ST-segment elevation: Task Force for the Management of Acute Coronary Syndromes in Patients Presenting without Persistent ST-Segment Elevation of the European Society of Cardiology (ESC). Eur Heart J. 2016;37(3):267–315. Goldberg RJ, Currie K, White K, Brieger D, Steg PG, Goodman SG, et al. 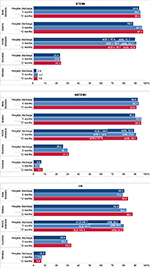 Six-month outcomes in a multinational registry of patients hospitalized with an acute coronary syndrome (the Global Registry of Acute Coronary Events [GRACE]). Am J Cardiol. 2004;93(3):288–293. Fox KA, Carruthers KF, Dunbar DR, et al. Underestimated and under-recognized: the late consequences of acute coronary syndrome (GRACE UK-Belgian Study). European Heart J. 2010;31(22):2755–2764. Hamm CW, Bassand JP, Agewall S, et al. ESC Guidelines for the management of acute coronary syndromes in patients presenting without persistent ST-segment elevation: The Task Force for the management of acute coronary syndromes (ACS) in patients presenting without persistent ST-segment elevation of the European Society of Cardiology (ESC). Eur Heart J. 2011;32(23):2999–3054. Task Force on the management of STseamiotESoC, Steg PG, James SK, Atar D, Badano LP, Blomstrom-Lundqvist C, et al. ESC Guidelines for the management of acute myocardial infarction in patients presenting with ST-segment elevation. Eur Heart J. 2012;33(20):2569–2619. Budaj A, Brieger D, Steg PG, et al. Global patterns of use of antithrombotic and antiplatelet therapies in patients with acute coronary syndromes: insights from the Global Registry of Acute Coronary Events (GRACE). Am Heart J. 2003;146(6):999–1006. Bhatt DL, Roe MT, Peterson ED, et al. Utilization of early invasive management strategies for high-risk patients with non-ST-segment elevation acute coronary syndromes: results from the CRUSADE Quality Improvement Initiative. JAMA. 2004;292(17):2096–2104. Haynes RB, Ackloo E, Sahota N, McDonald HP, Yao X. Interventions for enhancing medication adherence. Cochrane Database Syst Rev. 2008;(2):CD000011. Naderi SH, Bestwick JP, Wald DS. Adherence to drugs that prevent cardiovascular disease: meta-analysis on 376,162 patients. Am J Med. 2012;125(9):882-7 e1. Mansoor SM, Krass I, Aslani P. Multiprofessional interventions to improve patient adherence to cardiovascular medications. J Cardiovasc Pharmacol Ther. 2013;18(1):19–30. Van de Werf F, Ardissino D, Bueno H, et al. Acute coronary syndromes: considerations for improved acceptance and implementation of management guidelines. Expert Rev Cardiovasc Ther. 2012;10(4):489–503. Ciccone MM, Aquilino A, Cortese F, et al. Feasibility and effectiveness of a disease and care management model in the primary health care system for patients with heart failure and diabetes (Project Leonardo). Vasc Health Risk Manag. 2010;6:297–305. Stange D, Kriston L, von-Wolff A, Baehr M, Dartsch DC. 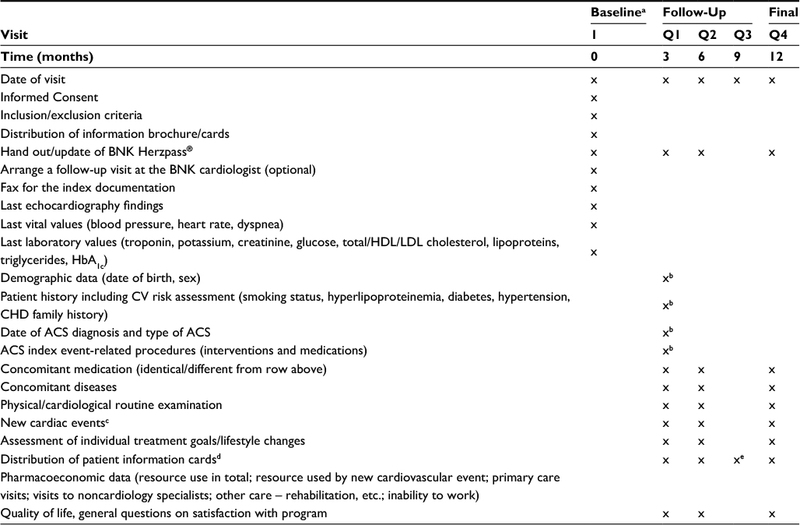 Reducing cardiovascular medication complexity in a German university hospital: effects of a structured pharmaceutical management intervention on adherence. J Manag Care Pharm. 2013;19(5):396–407. Luders S, Schrader J, Schmieder RE, Smolka W, Wegscheider K, Bestehorn K. Improvement of hypertension management by structured physician education and feedback system: cluster randomized trial. Eur J Cardiovasc Prev Rehabil. 2010;17(3):271–279. Steg P, James S, Atar D, et al. ESC Guidelines for the management of acute myocardial infarction in patients presenting with ST-segment elevation. Eur Heart J. 2012;33(20):2569–2619. Costa E, Giardini A, Savin M, et al. Interventional tools to improve medication adherence: review of literature. Patient Prefer Adherence. 2015;9:1303–1314. Dorler J, Alber HF, Altenberger J, et al. Primary percutaneous intervention of ST-elevation myocardial infarction in Austria: Results from the Austrian acute PCI registry 2005-2007. Wien Klin Wochenschr. 2010;122(7–8):220–228. De Luca L, Leonardi S, Cavallini C, et al. Contemporary antithrombotic strategies in patients with acute coronary syndrome admitted to cardiac care units in Italy: The EYESHOT Study. Eur Heart J Acute Cardiovasc Care. 2015;4(5):441–452. Bueno H, Danchin N, Tafalla M, Bernaud C, Annemans L, Van de Werf F. EPICOR (long-tErm follow-up of antithrombotic management Patterns In acute CORonary syndrome patients) study: rationale, design, and baseline characteristics. Am Heart J. 2013;165(1):8–14. Hanssen M, Cottin Y, Khalife K, et al. French Registry on Acute ST-elevation and non ST-elevation Myocardial Infarction 2010. FAST-MI 2010. Heart. 2012;98(9):699–705. Damman P, Varenhorst C, Koul S, et al. Treatment patterns and outcomes in patients undergoing percutaneous coronary intervention treated with prasugrel or clopidogrel (from the Swedish Coronary Angiography and Angioplasty Registry [SCAAR]). Am J Cardiol. 2014;113(1):64–69. Roter DL, Hall JA, Merisca R, Nordstrom B, Cretin D, Svarstad B. Effectiveness of interventions to improve patient compliance: a meta-analysis. Med Care. 1998;36(8):1138–1161. Nieuwlaat R, Wilczynski N, Navarro T, et al. Interventions for enhancing medication adherence. Cochrane Database Syst Rev. 2014;11:CD000011. Lambert-Kerzner A, Del Giacco EJ, Fahdi IE, et al. Patient-centered adherence intervention after acute coronary syndrome hospitalization. Circ Cardiovasc Qual Outcomes. 2012;5(4):571–576. Lambert-Kerzner A, Havranek EP, Plomondon ME, et al. Perspectives of patients on factors relating to adherence to post-acute coronary syndrome medical regimens. Patient Prefer Adherence. 2015;9:1053–1059. Loh JP, Pendyala LK, Kitabata H, et al. Comparison of outcomes after percutaneous coronary intervention among different coronary subsets (stable and unstable angina pectoris and ST-segment and non-ST-segment myocardial infarction). Am J Cardiol. 2014;113(11):1794–1801. Amann U, Kirchberger I, Heier M, et al. Long-term survival in patients with different combinations of evidence-based medications after incident acute myocardial infarction: results from the MONICA/KORA Myocardial Infarction Registry. Clin Res Cardiol. 2014;103(8):655–664. Barrabes JA, Bardaji A, Jimenez-Candil J, et al. Prognosis and management of acute coronary syndrome in Spain in 2012: the DIOCLES study. Rev Esp Cardiol (Engl Ed). 2015;68(2):98–106. Ferreira-Gonzalez I, Permanyer-Miralda G, Marrugat J, et al. MASCARA (Manejo del Sindrome Coronario Agudo. Registro Actualizado) study. General findings. Rev Esp Cardiol. 2008;61(8):803–816. Puymirat E, Schiele F, Steg PG, et al. Determinants of improved one-year survival in non-ST-segment elevation myocardial infarction patients: insights from the French FAST-MI program over 15 years. Int J Cardiol. 2014;177(1):281–286. Brown JP, Clark AM, Dalal H, Welch K, Taylor RS. Patient education in the management of coronary heart disease. Cochrane Database Syst Rev. 2011;(12):CD008895. Clark AM, McAlister FA, Hartling L, Vandermeer B. Randomized Trials of Secondary Prevention Programs in Coronary Artery Disease: A Systematic Review. Rockville, MD: Agency for Healthcare Research and Quality; 2005. Delgado-Rodriguez M, Llorca J. Bias. J Epidemiol Community Health. 2004;58(8):635–641. Jukema JW, Lettino M, Widimský P, et al. Contemporary registries on P2Y12 inhibitors in patients with acute coronary syndromes in Europe: overview and methodological considerations. Eur Heart J Cardiovasc Pharmacother. 2015;1(4):232–244. Ackroyd SH, Hughes JA. Data Collection in Context. New York, NY: Longman; 1992.